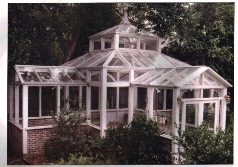 Build your own Greenhouse in the grand style of turn-of-century Victorian Conservatory. 448 sq. ft. Spectacular! Wood, Glass, and Brick Construction. 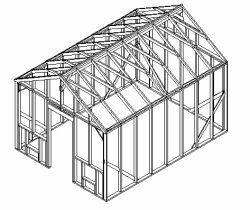 12 feet wide with a 30 degree sloped roof. 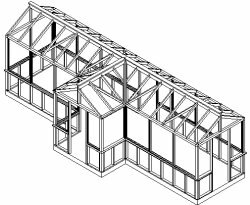 2x4 wood construction. 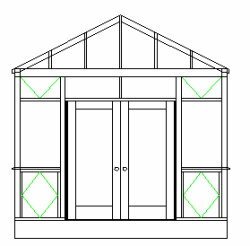 Plans for a 8'W greenhouse with hips and valleys so you can create a maze or garden border. Have a greenhouse instead of a fence! It's sure to keep the deer out of the garden. 30 degree sloped roof. 6x6 wood posts - heavy duty construction. 30 degree sloped roof, 10 feet tall walls. 6x6 post frame. 20’ x 20’ main room with (4) 10’ x 12 wings. Pyramid shaped roof. A powerful growing space. 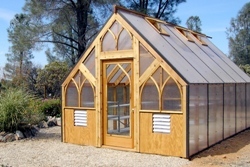 Save money and build your own Greenhouse! 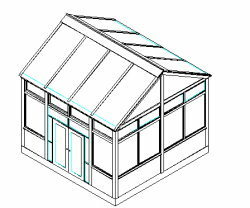 This site sells only plans so for kits, supplies, plants or book, please visit one of the sponsors below.